Andy Ockershausen:	This is Andy Ockershausen. This is Our Town. I’m so, so, so happy for a lot of reasons to welcome a very important man in the city of Washington and Our Town, a public servant. I mean, he has been in the police department or connected with it for 27 years on the force. But even since he left the force he’s been still in law enforcement. He’s just a terrific guy, an important part of Our Town, and a member of the … He was [sic] the Executive Director at the Washington DC Police Foundation. Pat Burke, welcome to Our Town. Patrick Burke:	Thanks, Andy. Good to be here. Andy Ockershausen:	You have been amazing to me in all the things I’ve seen you do over the years. I remember you in uniform, I remember when you started wearing neckties like the rest of us. Now, none of us wear ties anymore, Pat. Isn’t that great? Patrick Burke:	It is great. It’s nice to not have to worry about that every day. Andy Ockershausen:	But you always dressed like $1 million, and you had that clean white shirt. and I wouldn’t say this unless she was here. I would have loved to have Cathy Lanier. I know you worked close with Cathy. She was such a big, important part of Our Town because of what she did. Andy Ockershausen:	She had a house in Maryland, I know. Patrick Burke:	She still does, so she’s still back in town pretty regularly, and she’ll actually be at an event in December back in DC. So glad to hear she’s doing well with the NFL, and we’re glad to have Chief Newsham here, as well. Andy Ockershausen:	Well, Cherrie Doggett is having a cocktail Christmas party, and I’m sure she’s invited. Cathy was always there, and we got to know her through Bud, as we got to know the police department. But Pat, you’re a New Yorker. Not from Buffalo, but from Rochester. Patrick Burke:	As I tell my wife, who’s from New York, New York I’m from the real part of New York, Western New York. And most of my family is still Rochester, Buffalo, Syracuse. But I have to say, as much as I love them, there’s six inches of snow right now in Rochester, and I’ll see my mom and dad in the spring. Andy Ockershausen:	Yeah, but it’ll be gone by July. Patrick Burke:	By usually March. I remember Lake Ontario was frozen through St. Patrick’s day. Andy Ockershausen:	Yeah, they close the lakes off, and everything up there was frozen. But Pat, how did you end up in the police department? You went to school in New York in the State University of New York? Patrick Burke:	Yep, I did my undergrad at University of Buffalo, started grad school up there, actually came down to look at American University in DC, law school, and one of my good buddies was working vice for the second district. They said, “Pat, save money. Join the PD.” It was the height of the crack epidemic in 1989, so he said, “Come on down and save some money.” So I joined the police department. I fell in love with it, and 27 years later I woke up and I had a great career, and my last nine as Assistant Chief. Andy Ockershausen:	Well, it’s not over. You’ve still got a great career. But what you’re doing is great for the police department and great for Washington PD, but your wife, you say from the other New York, she’s a New Yorker? A Long Islander? Patrick Burke:	She’s lost the accent, but she’s from Queens. Andy Ockershausen:	But Long Island City’s gotten in the news here recently. Patrick Burke:	They have, so it’ll be good for that area as well as hopefully for here. Andy Ockershausen:	I remember riding through on the way to La Guardia. It was not what I thought New York was. Andy Ockershausen:	But they’re going to change that now, as they’re changing Our Town with what’s happening at Amazon over in Alexandria and Arlington. As you know, it’s just going to blow everybody crazy with the traffic problem. Patrick Burke:	Absolutely. The city, from when I came here 30 years ago, it’s changed dramatically. You see that from the Wharf to everything else taking off. On a daily basis you drive through parts of town. I’m in Anacostia a lot, and I don’t recognize what it used to be when I was a rookie officer. Andy Ockershausen:	I can share that with you 1000% because we cut through Anacostia a lot going places, and I’ve seen the change. And I know about Anacostia High School and Kramer. There were a lot of problems for a while. That’s going to change because the population’s changing. Patrick Burke:	It is changing, and the nice thing to see is the city put a lot of investment into the infrastructure of the schools. They are beautiful facilities right now, and there’s a lot of kids that want to do great things and a lot of potential. But there’s still a lot of work to do. Andy Ockershausen:	You know, I’ve been connected with THEARC for years, and had done a lot of charity work with them. When I was alive with WMAL, we worked with all those people, and we knew it was … It had to happen. The neighborhood had to change, and now it’s going to be a blessing what’s going to happen to Anacostia. Andy Ockershausen:	And like you say, putting the money in the school. It’s all about money. But you went to GW while you were here in Washington. Were you a policeman when you went to GW? Patrick Burke:	You know, I was very fortunate. Chief Ramsey took me under his wing as a young Lieutenant, and the department paid for me to do my master’s degree at Johns Hopkins. Patrick Burke:	I did my Certificate of Public Management at GW. And then the federal government sent me to Naval Postgraduate School for two years in Monterey. Andy Ockershausen:	For two years in Monterey? Did you take your wife, I hope? Patrick Burke:	She came out for a visit for a couple quick weeks with the kids. Andy Ockershausen:	It happened in Monterey. That was Mexico, but in California that was a beautiful place to be. Patrick Burke:	It is fantastic. Andy Ockershausen:	That was a language school there for a while, wasn’t it? Patrick Burke:	It still is. Andy Ockershausen:	That’s what it is, they learn a lot of foreign languages, I know. Patrick Burke:	Absolutely, and it’s a beautiful part of the country. Andy Ockershausen:	Oh Pat, that’s just great that you had that. You mentioned the Chief. I thought it was a major statistic that Janny pulled out for me, the number of police chiefs you worked for when you were in the department. Patrick Burke:	Yeah, we definitely had a lot of transition. Patrick Burke:	Especially early in my career. Andy Ockershausen:	Eight, that’s incredible. Eight police chiefs. And I go back way before these chiefs, but this goes back to Maurice Turner. I know this. You know, he ran for Mayor remember. Patrick Burke:	I do remember. Andy Ockershausen:	And he got beat. I was campaigning for him. I thought he was a great guy and we had a great relationship, but he didn’t win. But look at the names: Ike Fulwood, and Fred Thomas. Fred Thomas was involved with the Boys and Girls Club, if you remember. Andy Ockershausen:	Police Boys and Girls Club. Sonya Proctor, interim. Patrick Burke:	Was the interim chief. Andy Ockershausen:	Ramsey, I like Chuck Ramsey and his sidekick was running the Capitol police. Patrick Burke:	Terry Gainer who came over, was the head of the Illinois State Police, came over, and then consequently became Senate Sergeant at Arms. Andy Ockershausen:	Is he still in … He’s not in that job anymore. Patrick Burke:	No. He’s back in Illinois, comes from a great police family, actually from Chicago PD, a great history including loved ones, family members they’ve lost in the line of duty. And his son, Tommy Gainer, who’s a great cop, worked for me in Homeland Security and still works for them today. Andy Ockershausen:	Now, in Washington? Was he born here? Andy Ockershausen:	When his father was here? Andy Ockershausen:	Terry Gainer was a very good friend of us, a friend of WMAL, a friend of mine, and certainly he worked for Chuck Ramsey. We liked him very much. He was a good guy and did a lot of great things for Our Town. Patrick Burke:	I tell you, when you think of, when I look back to all the chiefs that I’ve worked for and some great people, Ramsey, when I think of American law enforcement, he’s kind of … And he wouldn’t want me to call him maybe the grandfather, but he is just a well-revered, caring person who was so knowledgeable and a great asset to American cops. Andy Ockershausen:	He’s done a great job in Philadelphia. They love him. I know that. Patrick Burke:	From DC to Philadelphia. Now he’s working on consent decrees and doing a lot of consulting work with police departments, but he’s just a fantastic person. Andy Ockershausen:	A great, great cop. And then to work for Cathy Lanier, that must have been a great thrill for you. She not only was a good cop, she was a good-lookin’ cop. We thought Cathy was a very dear friend. Patrick Burke:	Well, we used to laugh a little bit sometimes, because when we’d fill in for Chief Lanier as Assistant Chiefs, and I was an Assistant Chief for her for nine years, but I’d always say, when you’d go to an event they’re expecting to see a 6′ blonde, and you get the 5’11” guy. It really wasn’t the highlight. But she, you know I give Lanier a lot of credit. She’s super hardworking, extremely smart, especially in the areas that I was working with in Homeland Security, and she’s a great fit for the NFL as well. Andy Ockershausen:	Well that was a great challenge for her, but she was so, so good at it and got along with everybody. And she did a lot of work for Heroes, I know that. And you know how close I am to Heroes, to be one of Bud Doggett’s guys from 1964. That’s a long time ago. Patrick Burke:	That’s a great run, and we’re always very appreciative. I’ve worked with … I was fortunate to meet Bud many years ago and did a lot of fundraising back at the time with the police department when I was still there, but so great to know that our officers are taken care of anywhere in the region, if they’re to die in the line of duty and know that your family is taken care of. Andy Ockershausen:	And you know that has grown like topsey turvey because all these new forces they put in. But Heroes has managed to keep up with the money trail so it can still support these officers and firefighters, their families. If they need be, they still have the money. Patrick Burke:	Absolutely. And especially with the college tuitions the way they’ve risen. The need is great to continue to support that cause. Andy Ockershausen:	Well you know how that is. I mean, sending these kids, no matter where the kid wants to go, Heroes will support them. And one of them ended up playing for the New York Giants. Andy Ockershausen:	And he came back and gave money to Heroes. We were so happy with that. Andy Ockershausen:	And then the mayors. How many? You had six mayors while you were in the department? Patrick Burke:	Six mayors. Some you get to know a little bit more than others. Unfortunately the city, when I came in, didn’t have much money. It was a tough time for the police department, too. You know, and I think back to Fred Thomas, who I thought was a wonderful person, but we just didn’t have a lot of money to do many things. But I think Ramsey, when he came in, was really the change agent that DC needed. Patrick Burke:	I consider the team of Ramsey and Mayor Tony Williams. They really made this city what it is, and I look up to both of them. And I’m actually very fortunate to work with Tony Williams. He runs the Federal City Council. Andy Ockershausen:	I know. You still side with him. Patrick Burke:	And we share a suite together. He actually founded the DC Police Foundation, along with Ramsey. So, everything that I have in DC, I owe to Tony Williams and Chief Ramsey. Andy Ockershausen:	You were very fortunate to have these good guys when you came along, Pat. Patrick Burke:	Absolutely, and mentors. Andy Ockershausen:	Oh yeah. They taught you a lot. Patrick Burke:	Everybody that I worked for, including Chief Newsham, who’s the current Chief. We were Assistant Chiefs together for many years, and he’s a sharp, hardworking, caring individual. Andy Ockershausen:	Right. Peter’s been on the program sitting right where you are and talked about the same things. We’re going to take a break now, and we’ll be right back. I’m talking to Patrick Burke of the US Marshal Service. Not anymore. Patrick Burke:	Not anymore. DC Police Foundation. But that was a good run, too, and a pleasure to work for Obama. Andy Ockershausen:	You’re a good man, Pat. There are places for you everywhere. This is Our Town. This is Andy Ockershausen. Andy Ockershausen:	This is Andy Ockershausen. 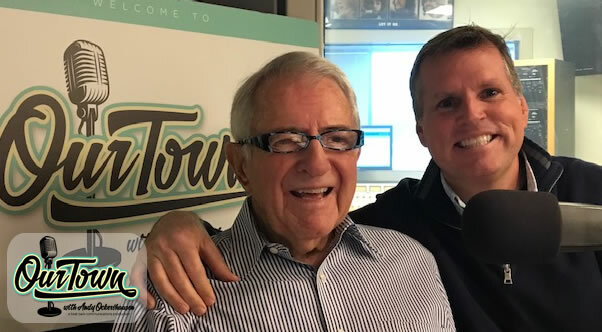 This is Our Town, and I’m talking to Pat Burke who’s seen it all and done it all in his 27, 30 years in Washington connected with the police department. One of the things I was so happy to hear is that the police sent you to school to further your education, which made you a better police officer. Patrick Burke:	Absolutely, and that was so fortunate, once again, to have had the opportunities to attend Johns Hopkins, George Washington University, great institutions. Andy Ockershausen:	You couldn’t have done that as a civilian. No, you wouldn’t have went. But as a cop you had something to learn, and that’s the chief. It was his idea, correct? Patrick Burke:	Absolutely. But you know what? All of our officers have opportunities for excellent training. That’s why one of the great things about cops. Andy Ockershausen:	Like military, correct? Andy Ockershausen:	And they did know who we were. Patrick Burke:	They did, and they do a different type of vetting in Israel, whether it’s at the airports or at their security checkpoints. And I have to say, it was a great opportunity to see what was happening. This was just after they’d had spats of bus bombings, so there were some security issues there. But it was great to meet some people and see what they do. Patrick Burke:	And how they employ their operations. Andy Ockershausen:	Exchange ideas is what it’s all about. And they’re into it every day with those rocket attacks. But that’s a different world. Thank God we don’t have that here, but we have enough problems on the street with our society and the Metropolitan Police Department’s been at the site of all of it. And there’s so much going on every day. Reading about this kid on Benning Road just the other day. I mean, it doesn’t seem to end, Pat, and the young people are getting … They’re shooting each other. Patrick Burke:	It’s a sad thing, and fortunately from the time I came on when we were close to 500 homicides a year and we were called the city of unsolved homicides. Andy Ockershausen:	That was the crack time, wasn’t it? Patrick Burke:	Absolutely. Things have changed dramatically. Well, numbers are up a little bit in homicides this year. It’s still the gangs, guns, drugs, and sadly instead of people fist fighting over a girl, something as simple as that, somebody will pull a gun and shoot somebody and take a human life. It’s just sad, I think, for all of us to see that human life has so little value to some people. Andy Ockershausen:	It’s terrible, terrible. And you know, these people that are in trouble are not destitute. You know, they are driving and getting around town and they have cars and they have access to weapons, which blows my mind, but Pat, I’ve always maintained … I’ve always, since I’ve been old enough to understand a problem, it’s not a police problem. The police cannot solve this, I don’t believe. The public or society must solve it, and that begins at home. Patrick Burke:	I agree. It’s a combination of all our institutions. It’s family, and we look at how many families are broken in this city. Religion, education, everything comes together. Patrick Burke:	And the police realize that, as well, and I think that’s why we work closely through the mayor’s office in involving all the other agencies, as well. To give you an example, when you think about all the mental health consumers on the street that commit crimes, or you think about the poor female jogger who was killed not too long ago on Logan Circle. But people that have some sort of mental health issues, the police department can’t just arrest our way out of those situations. We have to work, and we do work closely with Department of Mental Health, Department of Behavior Health. MPD now trains officers as crisis intervention officers to talk to people that have mental health crises and really involve the whole system. Patrick Burke:	And I agree. You have to do away … You may have heard the term, “Snitches get stitches.” And you have to do away with that mentality, although a lot of the challenges, though Andy, are parents might not be involved with their child whatsoever. Unfortunately, if you look at some of the demographics of this city and look at how many children are growing up without two parents in their household. That’s one of the institutional challenges. Andy Ockershausen:	He was a big family man, as you know. But I still think that … And there’s civil liberties involved and so forth, but I mean, to strip searching these out, or whatever you can do. But somebody in that neighborhood has to know there are guns available, and the families have to know it. I mean, they just have to if they pay any attention. Some of them don’t pay any attention to their children. Andy Ockershausen:	You know, I’m from Eastern High School, and our school was really bad for a while. Now it’s come back to be a paragon in the city. Eastern has really straightened itself out. Then I read about the kids getting into the Ellington School that don’t live here. Andy Ockershausen:	And we can’t find a new school chief. Patrick Burke:	Right. And one of the things the police department does to work with the schools, they have over 130 officers specifically assigned as school resource officers, and that’s where the DC Police Foundation pitches in, as well. Obviously we want to build rapport between police officers and the communities, especially with our youth. So we’ve got officers in myriad DC schools where the officers, the school resource officers are going in, working on a curriculum, teaching kids civic responsibility, see something say something, how to deal with bullying, and getting them out of the city on occasion, as well to take trips to places like Gettysburg, Mount Vernon, a pumpkin patch, the Statue of Liberty with cops to give them good experiences outside of their day to day environment. Andy Ockershausen:	Pat, you’re preaching to the choir. I grew up in DC at the Boys and Girls Club, which used to be the Boys Club. We turned it into Boys and Girls Club, and it was the Metropolitan Police Boys and Girls Club. And that was a great effort by Our Town, a great effort for these kids. We had a camp, had good funding, and I would see kids in this camp that had never seen that much grass. They’d never seen that much water. They had no idea what that river was there, you know? Andy Ockershausen:	And that was a great thing by the city. Now it’s just the Boys and Girls Club. The police are out. Patrick Burke:	The police are out, although we still run, through the DC Police Foundation, we run the DC Police Athletic League. Andy Ockershausen:	Who funds the foundation? I don’t mean to interrupt, but who funds your foundation? Patrick Burke:	All of our corporate sponsors. We have groups funding all of these youth programs that we do. We have great partners in the city like Department of Forensic Sciences where we’ve actually got some youth from Anacostia High School over there today. So it’s a mix of corporate sponsors and even individual citizens that want to help out that provide donations or simple things. Andy Ockershausen:	But is it a national organization? Patrick Burke:	We’re focused on the DC Police Department. Andy Ockershausen:	Okay, but you have compatriots in other cities doing the same work, I’m sure. Patrick Burke:	Absolutely, and I just spent some time in IACP in Orlando this past October, and there’s hundreds of Police Foundations. I like to think that we’re doing great, but as the section chair for the Police Foundations committee, I’m able to see what all the foundations nationally are doing, and we are doing a great job, especially building rapport here in DC. Andy Ockershausen:	So you have peer groups, then you can work against, and everybody tries to do a good job? Patrick Burke:	Absolutely. We try to help everybody out. Andy Ockershausen:	This has been Our Town. This is Andy Ockershausen talking to Pat Burke. We’ll be right back. Announcer:	You’re listening to Our Town with Andy Ockershausen brought to you by Best Bark Communications. Andy Ockershausen:	This is Andy Ockershausen in a great conversation with Pat Burke, and to look at some of his awards, it’s no doubt in my mind he got this wonderful job. He got the Straub Award for academic excellence and leadership, he was awarded the Public Service by the National Highway Traffic Safety Administration. That’s a biggie. He received MPD’s Achievement Award for meritorious service, a lifesaving medal and police medal, and received the Morris and Gwendolyn Cafritz Foundation award for distinguished DC government employees because of your excellence in public leadership. Cafritz’s did a lot for Our Town. Patrick Burke:	They have. And I’ve always been involved in traffic safety. That’s kind of been one of the things that I caught on. Andy Ockershausen:	That’s your baby, huh? Patrick Burke:	I worked in special operations division as an officer back in the early ’90s when DUI numbers were through the roof. I got involved in an organization that we both work with, the Washington Regional Alcohol Program. Patrick Burke:	That works to keep drunk drivers and underage drinkers off our streets. And I’ve always been committed to that cause, and I’m still committed to that cause. Patrick Burke:	Once again, those are preventable incidents. And I have to say, even through all the tough times with homicides and making notifications to families, the toughest thing I ever had to do in my career was tell somebody that their child or their husband or wife or a loved one wasn’t coming home because of a traffic fatality. And that’s 100% preventable. It still is, these incidents, and there’s so much more we can continue to do to make sure that people aren’t drunk driving or paying attention to what they’re doing on the roads. Andy Ockershausen:	Well God bless you, Pat, and God bless everybody that’s in that effort, because I’ve been in the first one, and I’m one of the still the old dogs left, but it was so tragic to me to see young people dying in traffic accidents in so-called happy hour. They go to happy hour and they get in a car and drive home. Driving me crazy. Patrick Burke:	Right. And one of the good things to see now, Andy, I know with four kids, teenagers and above now. Patrick Burke:	They’d never think about drinking and driving with Lyft and other ride-sharing services out there. It’s not an option for them. Andy Ockershausen:	And they can call you to get home, too. Andy Ockershausen:	Now, tell me about your four children. We haven’t talked about that. Are they New Englanders? Patrick Burke:	No, I’m very proud of my four kids. My oldest, Brigid had just graduated. She’s a business major and is now working in Disney. So, loving life down there. Andy Ockershausen:	Oh great, in Orlando. Andy Ockershausen:	So you had a place to stay when you were down there. Patrick Burke:	I did. Or at least someone to visit quickly. I’ve got a daughter, Molly, who’s a junior out at UC San Diego. And if you’ve never been to La Jolla, it’s another fantastic part of the country. Andy Ockershausen:	What a terrible place to live. How can anybody take that? Patrick Burke:	I have a son, Breandan, who’s a sophomore at University of South Carolina in chemistry and chemical engineering doing great. Andy Ockershausen:	Not as good as California, but not bad. Patrick Burke:	If you haven’t been to Columbia, it’s a beautiful place. Andy Ockershausen:	Oh, I know South Carolina’s fabulous. Patrick Burke:	A great city. And then my daughter, my baby, Claire Divine is a junior at Georgetown Visitation, just getting ready to start basketball season and ready to roll. Andy Ockershausen:	You’ll be at all the games, of course. Patrick Burke:	I’ll be at almost every game, except for Cherrie Dogget’s party. I’ll have to be at Cherrie’s. Andy Ockershausen:	Oh, we’ll be there. Is there’s a game that night? Patrick Burke:	There is a game that night. Andy Ockershausen:	What’s her party? I think it’s the 13th. Now don’t forget that. Andy Ockershausen:	And I hope Cathy Lanier comes if she’s in town. I know Cathy and Cherrie are very close, and should be. Patrick Burke:	Yeah. And Cherrie’s done a great job running Heroes and doing some wonderful things there. Andy Ockershausen:	She has. It’s unfortunate you didn’t have more time with Bud Doggett, because he was so spectacular for Our Town, and very tight with the police department, because he was there and he brought the city to bear with the police, you know. Andy Ockershausen:	It wasn’t just the police. He had bankers and automobile business people that owned the city, and they got him tough with close to the police department. Because the police is for all of us, and it’s so important. So Pat, what about these Irish children you have? It’s going to be sometime you’re going to have to slow down, here. Patrick Burke:	Well, we’ll see about that. We’re trying to spend some time up in New York a little bit in the summer, and hopefully some time in the south a little bit more in the winters as I get older. As I said, love Western New York. It’s a great place to grow up, but not someplace I’ll be spending a lot of time as I get older. Patrick Burke:	My kids know when I made this promise, somewhere in my childhood, I asked God, “Please get me through these cold days and I’ll never complain about heat.” And I will never complain about heat. Andy Ockershausen:	Did you go to college … University of Buffalo used to be a name. Then I read about them. They had great basketball, and now they had a good football team, and a good coach. Patrick Burke:	Buffalo is great between Buffalo State, University of Buffalo, Canisius, so many great schools up there. My sister went to Niagara. One of my older sisters. It was a great place to grow up and get to school. Andy Ockershausen:	Niagara, is that a Catholic school? Patrick Burke:	That is a Catholic school. Andy Ockershausen:	I know Canisius is world-famous, right? Andy Ockershausen:	And the University of Rochester, but that’s state school. Patrick Burke:	No, University of Rochester and Rochester Institute of Technology are both private schools, too. Great reputation. Andy Ockershausen:	Oh are they? Patrick Burke:	Great engineering school. Andy Ockershausen:	Probably Kodak put them all there, huh? Patrick Burke:	Yup. And Kodak was a great resource in Rochester. My dad worked there 31 years. I did a couple summers there. It was a great place to grow up. We grew up with Kodak. We played softball, a lot of our sports, I went to the movies at Kodak, we bowled at Kodak and did everything growing up at Kodak. Andy Ockershausen:	Well Buffalo’s loss is our gain, Patrick Burke. I’m so glad that you’re here. I’m so glad that you adopted our city as your own, because we needed a lot of bright young people, and you’re certainly one of the leaders. And if my wife is applauding the whole idea, I know we’ve had a good program. Andy Ockershausen:	Any questions you want to ask Janny O? Janice Iacona Ockershausen:	Well I did … I don’t know if it’s too late to talk about it. Andy Ockershausen:	Never too late. Janice Iacona Ockershausen:	But I did want to ask you, when situations where you get into where you have large crowds and crime situations or terrorist attack or something like that, how do you know what the pecking order is for the management of the situation? Andy Ockershausen:	Is that right? That’s a great idea. Patrick Burke:	Make the relationships before something bad happens. And just to give you an example, when I think about a critical incident like the Holocaust Memorial shooting in June of 2009. There was a scene at the US Holocaust Memorial Museum, US Park Police had the lead and when a 36 year old special police officer died, MPD took command of the incident. And I remember at the time, it was Rob MacLean, who’s the current chief of US Park Police, and I was the incident commander for MPD. And it’s a seamless transition, because there’s no arguing over who’s the boss. It was always that way with the FBI, too. I think they get a bad rap in the media, but we always had a great relationship with the FBI here too. It’s everybody working together. You know, when you think about inaugurals, state of the unions, concerts on the Mall, we do this stuff every day. Chief Jeff Carroll has Homeland Security right now, too. And it’s just a matter of being a leader who’s willing to work with others and set aside the differences and the egos and work together to get the job done. Andy Ockershausen:	I think that having these informal receptions like a cocktail party or to get together the Chiefs really makes it easier to get along when you have a problem. Andy Ockershausen:	You settle it before you have the problem, right? Patrick Burke:	Absolutely. And there’s a concert coming up at Constitution Hall that our local commanding general from military District of Washington is putting together, and they’ll bring together these regional chiefs and their families, you get to know each other. Andy Ockershausen:	Oh wow. That’s a great, great show. Well, I know everything down at Fort McNair and all the great things, and it’s good that you can get together, because the military is very important here, obviously. The military industrial world that we live in. But Pat Burke, thank you so much for all you’ve done and all you’re going to continue to do for Our Town. It’s people like you that make Our Town. Sorry Rochester, but he’s our guy. Pat, you have the last word. Patrick Burke:	No. Thanks, Andy. It’s been a pleasure to live and raise my children in Washington DC. There’s no other place like it, and it’s a great place to be a cop. We always need good people down here, and I’d encourage if anybody’s out there listening and they’re interested in that kind of work, it’s so rewarding, and I’d do it all again. Andy Ockershausen:	Pat Burke, a great, great policeman. This is Andy Ockershausen. This has been Our Town.